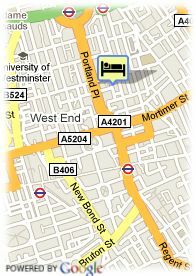 20, Hallam Street, W1N5LF London, United Kingdom. 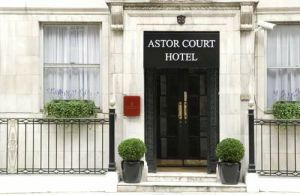 Hotel Astor Court is located between Regents Park and Oxford Street near shops. It has a car parking, restaurant, bar and daily papers. Comfortable rooms with bathroom, hair-dryer, telephone, television, tea and coffee. Free open air parking at the hotel. Park, Centre, Near shopping centre. Children less than 4 year(s) old: free of charge. For older children and adults 39.00 € for each additional bed is charged. Visa, Diners Club, Maestro, Mastercard, American Express, Switch.